This thread is for discussion of the setup/installation of OpenELEC/LibreELEC/Kodi on the Haswell and Broadwell-based ChromeBoxes using the Kodi E-Z Setup Script as detailed below, and any related ChromeBox-specific hardware issues. Other configurations, including installing Windows, dual-boot setups not involving ChromeOS, etc, will not be supported in this thread. Video playback related issues should be discussed in the Linux support forum (or, if add-on related, in the correct forum/thread), as they are 99% likely not ChromeBox-specific. Be sure to read the Kodi wiki page on how to provide the necessary info in order to troubleshoot your issue. Be sure to read both this first post and the ChromeBox wiki page in their entirety before posting. When reporting a problem, be sure to include whether you are running a standalone or dual boot setup, date stamp from SeaBIOS version string, OS / OS version, and kernel version (if not running OpenELEC/LibreELEC). Posts which do no conform to the topic of this thread will be moved or deleted, at the discretion of the forum moderators. The Kodi E-Z Setup Script was developed in order to simplify the setup/installation of Kodi on the Haswell and Broadwell -based Asus/HP/Acer/Dell ChromeBoxes (with Celeron 2955U/2957U, Celeron 3205U, Core i3-4010U/4030U, Core i3-5010U, Core i7-4600U, Core i7-5500U CPUs). 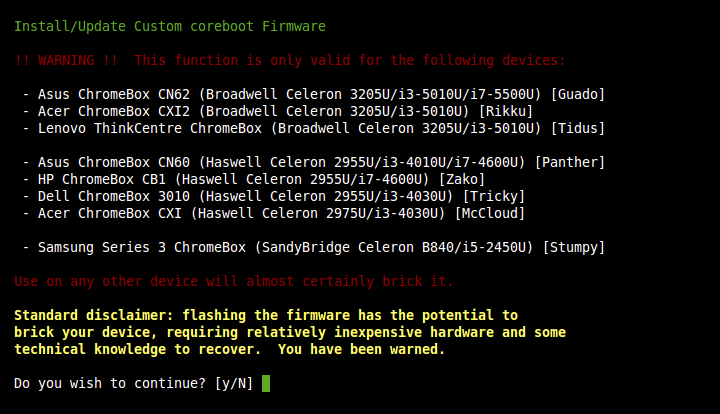 Recently, support has been added for Haswell/Broadwell/BayTrail Chromebooks as well. Before running the Kodi E-Z Setup Script, you must perform the steps in the device prep section of the wiki (put the ChromeBox in developer mode, and disable the firmware write protect). If you are planning on installing a dual-boot setup, you must perform a factory reset using recovery media created by Google's recovery tool prior to running the script for a dual-boot install. The parameters to the curl command are capital L and capital O. This option will install GalliumOS (a Ubuntu derivative) in a dual boot setup with ChromeOS, plus install the latest stable version of Kodi (16.1). IMPORTANT: Installing a dual boot setup occurs in two stages, and requires this script to be downloaded and run twice. In the first stage, the script will prompt you for the partition size to use for GalliumOS, then re-partition the internal HDD to make room. After a reboot, press [CTRL+D], and ChromeOS will "repair" the newly created partitions and reboot itself. Once it completes the repair, you will need to re-download and re-run the script to complete the second phase, during which GalliumOS will be installed to the newly created partition. After completion of the 2nd stage, use the 'Set Boot Options' menu option to set your preferred boot delay and default boot option. As the dual boot GalliumOS/Ubuntu makes use of reynhout's chrx install script, the default user/password are set to 'chrx'. You can change these after logging in the first time. Note: If you had previously set up OpenELEC/LibreELEC, you will need to reset the Boot Options (to ChromeOS + 30s timeout), and then perform a factory reset before installing GalliumOS. This option will install LibreELEC in a dual boot setup with ChromeOS. In the first stage, the script will prompt you for the partition size to use for LibreELEC , then re-partition the internal HDD to make room. After a reboot, press [CTRL+D] and ChromeOS will "repair" the newly created partitions and reboot itself. Once it completes the repair, you will need to re-download and re-run the script to complete the second phase, during which LibreELEC will be installed to the newly created partitions. Note: if you previously installed GalliumOS (or Ubuntu) in a dual boot setup, you will need to reset the Boot Options (to ChromeOS + 30s timeout), and then perform a factory reset before installing LibreELEC in a dual boot configuration. 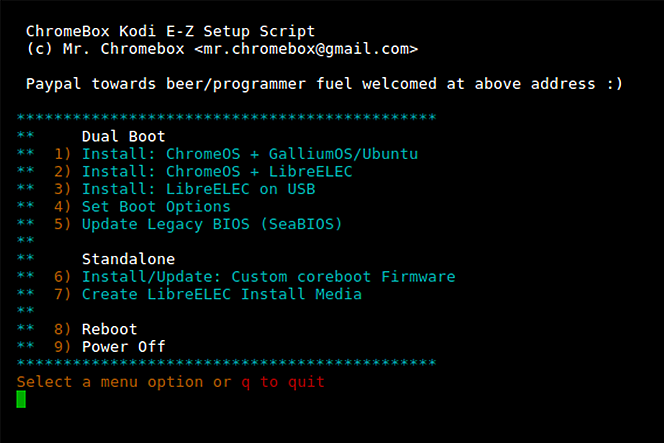 This option will install LibreELEC on a USB (or SD) device, along with a bootloader which is compatible with the stock ChromeOS firmware. The script will prompt you to select which version of LibreELEC to install (if a beta version is available), select the USB device on which to install LibreELEC , download/install the bootloader (onto the selected USB/SD), and download/install OpenELEC. Once completed, the script will check if an updated Legacy BIOS is available for you system. If so, you will have the option to set the default Legacy boot target to USB, and the updated Legacy BIOS will be installed. 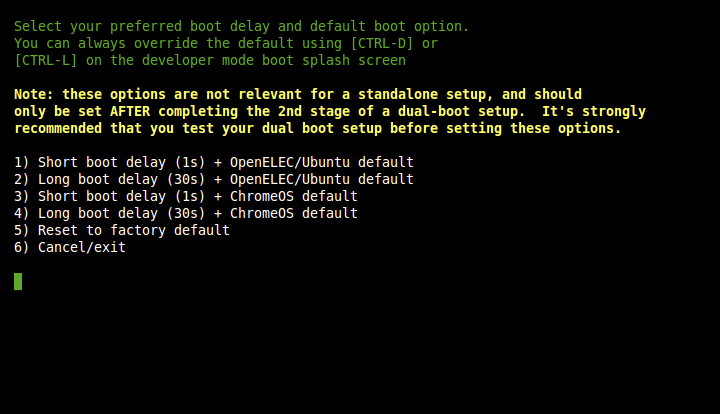 After completion, use the 'Set Boot Options' menu option to set your preferred boot delay and default OS boot option. This option will allow you to set the boot delay (30s or 2s) and the default boot option (ChromeOS or Kodi [via LibreELEC/GalliumsOS]). The choices of 30s and 2s are a limitation of the stock firmware; no other boot delay options are available. Choosing any option other than the factory default will automatically lock the ChromeBox into developer mode and force-enable legacy booting, preventing accidentally exiting via [spacebar] on the Developer Mode boot screen. Regardless of the option selected, on the Developer Mode boot screen (white screen w/"OS Verification Off" text) you can always press [CTRL+D] to boot into ChromeOS or [CTRL+L] to boot LibreELEC /GalliumOS. Note: this requires the firmware write-protect to be disabled. This option updates the Legacy BIOS component of the stock firmware (SeaBIOS) to the latest fixed version. This step is automatically performed as part of any dual-boot setup, and is only necessary to perform manually if an update is released with a bug fix or new feature of interest to you. There is also an option to give boot priority to connected USB devices. If selected, then the ChromeBox will try to boot any connected USB by default; if not, then the default will always be the internal SSD unless a manual selection is made via the boot menu. You will be given the option to backup the current/stock firmware to an external USB drive; it is recommended that you do this in the event you wish to revert the ChromeBox to stock / run ChromeOS (as the recovery button won't help you anymore), and since there is always a small risk anytime you flash/update the firmware. Since the Ethernet MAC address is stored in the firmware, if you are setting up multiple Chromeboxes, you need to do a firmware backup for each, since restoring the same backup to multiple boxes will result in them having the same MAC address, and cause serious network issues. 1) install a "headless" version of the firmware -- this is only intended for Linux servers which don't have a connected display, it shouldn't be used for Kodi setups. 2) give boot priority to connected USB devices. If selected, then the ChromeBox will try to boot any connected USB by default; if not, then the default will always be the internal SSD unless you explicitly press ESC and choose a different option from the boot menu. 3) add PXE network boot support. This enables booting from a network OS image, and isn't needed for most users. After completing this step, you can install any off-the-shelf Linux distro (GalliumOS, LibreELEC, etc), or even Windows 8.1/10, via USB -- no custom installers or workarounds are needed. If you're going to install LibreELEC, you should go ahead and create the install media now before rebooting. Upon reboot, if any USB/SD devices are connected, you will have ~3 seconds to press [ESC] to display the boot menu; otherwise it will boot directly to the default device (depending on your choice, internal SSD or USB). Note: this step requires the firmware write-protect to be disabled first. This option will create a bootable USB/SD LibreELEC install media, which can then be used to install LibreELEC in standalone mode. The script downloads the exact same file as you would from LibreELEC's website, the function is just added here for convenience. After completion, reboot and press [ESC] at the boot menu prompt, and select the USB device for installation. After booting the LibreELEC installer, choose the 'Quick Install' option, select [YES]/[OK] as needed. When installation is complete, remove the USB stick, choose the reboot option, and LibreELEC will be booted in ~6 seconds. Note: Installation of LibreELEC in standalone mode requires you to have installed my custom coreboot firmware, as detailed above. If you want to dual boot a different Linux distro, simply perform the Device Prep, then use the script to run the first stage of the GalliumsOS dual boot setup. Reboot, press [CTRL+D], and allow ChromeOS to "repair" itself and perform the partition resizing. Then, reboot in legacy mode [CTRL+L] and choose to boot from your distro's USB installer ([ESC] then option 2). Install Linux to partition /dev/sda7, and the grub bootloader to /dev/sda. Afterwards, you can re-run the script to set your boot options. If you want to install a different Linux distro in standalone mode, simply install the custom coreboot firmware, then, reboot and choose to boot from your distro's USB installer ([ESC] then select USB drive from list). Install to the entire internal HDD. For most users, updating the firmware after initial installation isn't necessary - I only recommend updating the firmware if a new version fixes a specific issue you are having and/or adds a new feature of interest; if it's not broken, don't fix it. If you do need to update the firmware, simply re-download/re-run the script under any Linux distro with a full bash shell. The dual-boot related options will be disabled, but the 'Install/Update coreboot firmware' option will be available. If you are running a Linux distro which does not have a full bash shell, such as OpenELEC/LibreELEC, you will need to boot a Linux Live USB (eg, current release of GalliumOS or Ubuntu) and run the Kodi E-Z Setup Script from there. Note: the old standalone firmware updater script for OpenELEC/LibreELEC is now depreciated and no longer available. This script is a work in progress, all feedback is appreciated and I'll do my best to implement any fixes/improvements. - tweaked dual boot / boot options flags to prevent accidentally exiting developer mode via spacebar. - removed standalone firmware support for the Acer C720 ChromeBook (Peppy) and the HP ChromeBook 14 (Falco), since testing revealed that these don't work as well as John Lewis' versions built from Google's Chromium sources. - added standalone firmware support for the Acer C720 ChromeBook (Peppy), the HP ChromeBook 14 (Falco), and the Samsung Series 3 ChromeBox (Stumpy). These devices are unsupported, but should work without issue. - updated to OpenELEC 4.2 beta 2 (4.1.2), which now includes working USB3 wake from suspend, so custom build no longer needed. - updated script to use a custom OpenELEC ChromeBox build for standalone setups, which enables USB3 ports to wake from suspend. Fixes the issue of IR remotes not being able to power on the system when suspended. Dual boot setups are unaffected since suspend/resume is broken anyway. installation without having to use the fix. BTW, few more screenshots will be great. What will happen if I run the script twice? Will it overwrite the previous installation? Can I use it to try OpenElec first and then Ubuntu, if I don't like OE? This is awesome Matt, should help some of those who were on the fence due to the somewhat complicated process take the leap. More exposure for the box with this kind of usage can only be a good thing for further development. Thank you for your continued efforts. Just great! Well, that depends. If you set up a dual boot setup with either OE or Ubuntu and want to switch to the other, you'll need to restore ChromeOS first using Google's recovery tool (outlined in the wiki) since each modifies the internal HDD structure differently, and trying to change it all dynamically is more work than I care to put in. If you dual boot Ubuntu and want to switch to a different metapackage or different linux distro, then no problem. But if you've installed OE (or anything else in standalone) you'll have to restore ChromeOS (which is pretty trivial) since you can't run my script other than in ChromeOS when booted from the internal HDD. what else did you want screenshots of? So if I already have Ubuntu 13.10 dual booted. I just have to run the script to install Ubuntu 14.04 over it without needing to reset the chromebox ? (2014-05-07, 23:39)Netix Wrote: So if I already have Ubuntu 13.10 dual booted. I just have to run the script to install Ubuntu 14.04 over it without needing to reset the chromebox ? correct, it will erase 13.10 and install 14.04 + updated kernel + MCE fix + XBMC. I've updated the OP with installation notes for each type when you don't have a "clean" system. This is great! Very nice! I am considering getting a chromebox and with this script I think my biggest hurdle has been removed ! Just curious about the noise level of the box, since I'm now running a raspberry pi (which is completely quite). I know the chromebox will be much faster scrolling my rather big library, but if I leave it on 24/7 will I always hear a slight humming noise or will the fan stop after a while? I think I'll run it 24/7 because I don't think you can power it on via a MCE remote, correct? +1 for an awesome contribution to the community. thank you very much for the script. It saved me a lot of headache as a newbie to this whole thing. However, when I installed ubuntu (dual boot), it created a user and I dont know the password. I was never asked to enter a password. Any help? How much space does the Chrome OS needs? It's displayed at the Instalation complete and press enter to go back to the main menu screen, from looking in the script.